A couple of posts ago I mentioned that I was given a sample of a heavenly (no pun intended!) frangrance called Blessings. I was enraptured by the warm, vanilla tones and was impressed by its longevity – it was easy to see that this was a fragrance of superior quality. I promised to share my discovery with you, as it is as heart warming as the fragrance itself! Blessings is not the creation of a large multi-national, nor is it another celebrity endoreded offering. 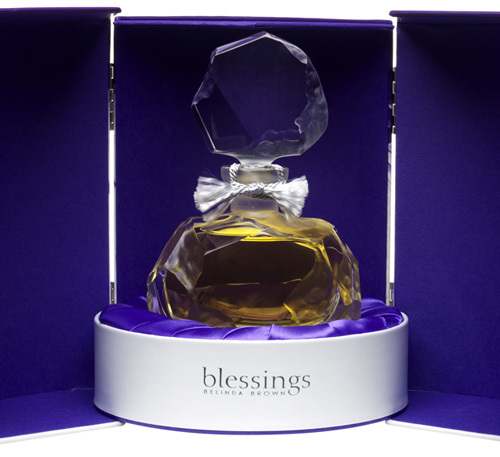 Blessings was conceived by a fragrance loving mother and wife (she even wear perfume to bed), whose passion and vision led to her fragrance being retailed in one of the world’s most famous department stores – the exclusive Roja Dove Haute Parfumerie in Harrods. 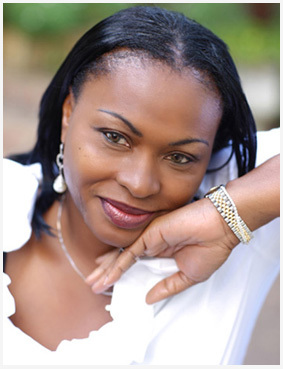 The creator is Belinda Brown, a native of the nation of Nigeria. An endearing love for a classic moisturiser called Stella pomade (a rich heady mix of lavender, jasmine and vanilla) that her mother would smother her in as a child and a chance meeting with the perfume connoisseur Roja Dove, resulted in the fabulous fragrance . So what is behind the name? Belinda – whose Christian faith is an important part of her personal and professional life – states that the inspiration came from the popular bible story of Mary’s Alabaster Box (the Gospel of Mark, 14:1-11). In his Gospel, Mark doesn’t actually mention the name of the woman, but the Gospel of John identifies her as Mary of Bethany, the sister of Martha and Lazarus – whom Jesus had raised from the dead. Jesus is the guest of honour at a gathering, and as He sits and eats, Mary enters the room with an alabaster box of perfume. Scripture identifies this perfume as spikenard, which was a very expensive fragrance imported from India. In verse 5, this small container of perfume is valued at three hundred pence, which was the equivalent of a year’s salary for a common worker. Some believe that this perfume may have been Mary’s dowry. If that is true, it was probably all that she really possessed. It was customary to wash the feet and anoint the head of a guest in your house, but Mary goes above and beyond. 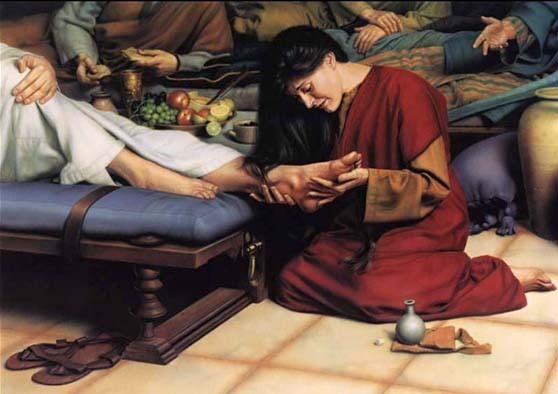 John says that she anointed Jesus’ feet and wiped them with her hair. She then breaks the container, and pours all of its contents on Jesus’ head – an extreme act of love and devotion. Belinda imagines that this loving act filled the house with an unforgettable fragrance and was thus keen to share her perfume and bring delight to others in the same way. Blessings is described as an exotic floral blend of bergamot, lemon and mandarin with a heart of jasmine de Grasse and rose de Mai. Cedar, sandalwood, tonka and vanillic notes create the warm dry down. The notes were personally chosen by Belinda in her private consultation with Dove. A bespoke fragrance from Dove can take up to two years to create and prices start at £25,000!! The expense was worth it, for once the fragrance had been created Belinda felt it was just to beautiful to keep to herself and asked Dove if it could be made available to other women. Dove gave her his blessing and in early 2010 30 bottles of Blessing parfum went on sale in Harrods at £675…and sold out within a month!! Thankfully, for those of us who do not want to forsake a month’s rent to own this magnificent fragrance, an EDP is available at the more accessible price of £75 and can purchased via the Blessings Perfume website.